The Supreme Court appears poised to let every state authorize sports betting. 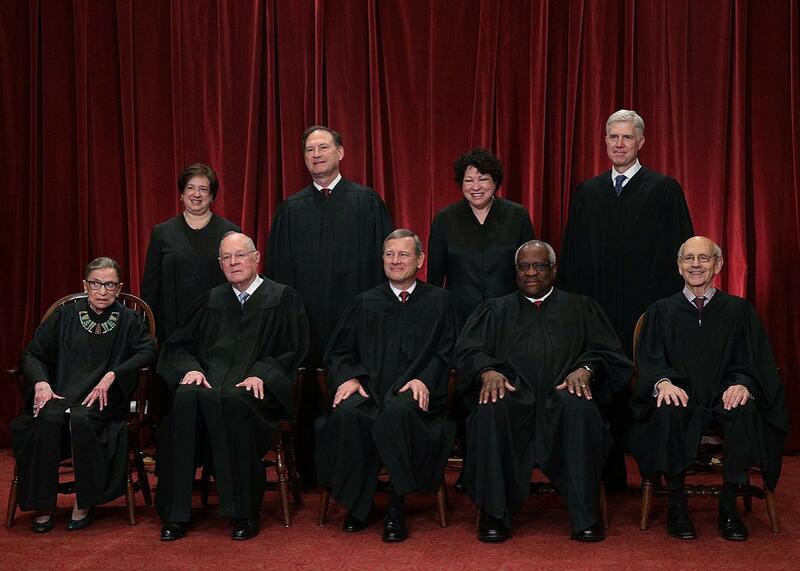 The U.S. Supreme Court justices pose for a group portrait on June 1 in Washington. Sports betting in the United States is a $150 billion business that goes largely unregulated. The vast majority of bets are placed illegally due to a federal law that effectively prohibits all but four states from offering legal sports gambling. On Monday, the Supreme Court heard a challenge to that law’s constitutionality. The case appeared to be a long shot when the court first agreed to hear it—yet on Monday, a majority of the justices seemed poised to invalidate the statute as a violation of states’ rights. Their decision could have monumental consequences for other legal conflicts between federal power and state sovereignty, preventing the federal government from penalizing sanctuary cities or shutting down state-level marijuana programs. In 2011, New Jersey residents voted, by a 2 to 1 ratio, to legalize sports betting, and Gov. Chris Christie signed a law authorizing gambling at casinos and horse tracks. A court struck down the state’s effort under PASPA. So in 2014, the legislature passed a new act that repealed existing criminal penalties on sports betting. Once again, the courts overturned the state law, citing PASPA, and New Jersey asked the U.S. Supreme Court to weigh in. The state faced long odds: There is no disagreement among lower courts on the constitutionality of PASPA, and the Department of Justice advised the justices to refuse the case—two factors that would ordinarily doom such an appeal. Yet the court agreed to hear Christie in June, suggesting serious doubts about the legality of PASPA. Why so much ado about gambling? New Jersey alleges that PASPA violates something called the anti-commandeering doctrine. Devised by the Supreme Court in 1992, this doctrine interprets the 10th Amendment to mean that Congress cannot “commandeer” state officials to implement federal policy. The court reasoned that “accountability of both state and federal officials is diminished” when, “due to federal coercion, elected state officials cannot regulate in accordance with the views of the local electorate.” Thus, Congress doesn’t get to achieve its policy goals by bossing states around. That’s a crucial distinction, because under the Supremacy Clause, Congress can pre-empt state law—that is, override it—by regulating something to the exclusion of the states. For instance, because Congress has asserted its authority to regulate immigration, states cannot pass laws that conflict with (or even supplement) federal immigrant law. That’s constitutional because the federal government implements its own immigration policy. Congress would only cross a constitutional line if it ordered state officials to carry out federal immigrant policy. Indeed, the Trump administration’s effort to defund “sanctuary cities” has been blocked by the courts in part because it commandeers state law enforcement to apply federal immigrant law. But this line is not always so clear, and Christie illustrates why. New Jersey claims that PASPA commandeers its legislators, proscribing them from repealing its sports betting ban. The NCAA and the Department of Justice argue that PASPA pre-empts New Jersey from repealing the ban as it represents Congress’ attempt to regulate sports betting nationwide. If New Jersey is right, then PASPA is unconstitutional. If the NCAA and DOJ are correct, then PASPA is just a pedestrian regulation mischaracterized by its opponents. But the key question of the day—posed in different ways by Chief Justice John Roberts, Justice Samuel Alito, and Justice Stephen Breyer—is how PASPA pre-empts state laws regulating sports betting when PASPA does not regulate sports betting itself. If PASPA were a traditional pre-emption law, it would create regulations for sports-related gambling, and override any state laws that purport to do the same thing. But that’s not what PASPA does. Rather than regulate gambling, PASPA directly regulates states. And by permitting limited yet lucrative exceptions, it fails to announce a clear federal policy on the topic of sports betting. Surprisingly, it is Breyer, a 10th Amendment skeptic, who articulated this point most lucidly. “There is no federal policy against authorizing sports gambling but for a federal policy that says a state can’t authorize sports gambling. And that is to commandeer,” he said. Although Breyer is no fan of federalism, he implied throughout arguments that the court’s precedents require it to invalidate PASPA. So did Roberts, who criticized PASPA as “odd” and asserted that it infringes upon “the fundamental powers and prerogatives of a state to function on its own.” Unless Alito and Justice Clarence Thomas back away from their steadfast support for state sovereignty, PASPA appears to be doomed. Eighteen states supported New Jersey in its quest to slay PASPA, and experts predict that 32 states will legalize sports betting by 2025 if the law falls. The court’s decision in Christie could help bring America’s vast underground sports betting market into the light of regulation, surfacing billions of dollars in revenue for the states. If you support legalized gambling as a matter of policy, as I do, that’s good news. But if you’re a progressive eager to stick it to the federal government at this political moment, be careful. A ruling against New Jersey would imperil state experimentation—which, right now, means shielding sanctuary cities and marijuana programs from federal oppression. (The feds can still punish undocumented immigrants and marijuana users, but it can’t make states do it for them.) Under the next administration, however, liberals may wish to use federal power to regulate red states, only to be thwarted by the anti-commandeering doctrine. Democrats would do well not to bet the house on states’ rights.